EPBOT: Eye Candy For Your Neck! I already had the crystals and chain, so this was a pretty easy upgrade for a $5 charm! Now I've moved on to a much more involved necklace project. Still not quite done, but here's a peek - and I think my fellow Disney fans are gonna liiiike it! I've since found better/thicker chains, so I'll be swapping those out soon, but quick poll: what do you guys think of the green/teal bead? Any good? As a Haunted Mansion homage I wanted both green and purple, but do you think I should try other colors, too? and Holly Denghal, who gets her pick from the Art Give-Away Board! 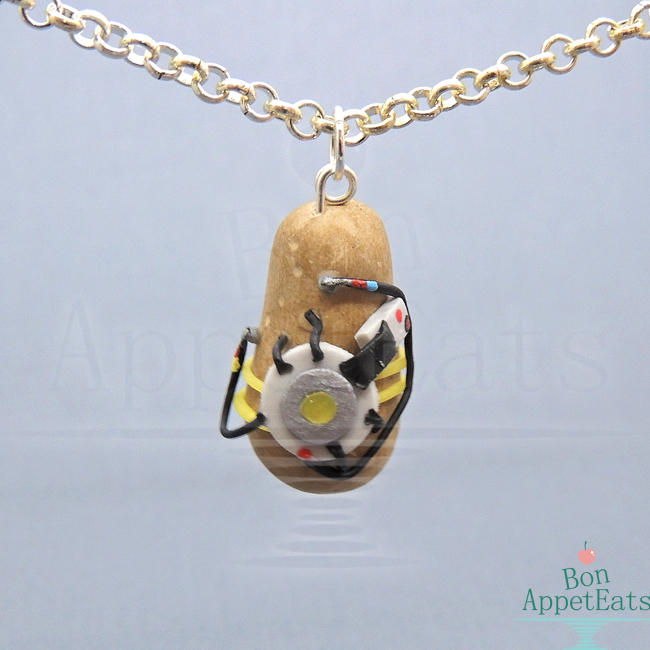 Squeee, my husband loves Portal, I feel like I just might need a potato necklace! Yay, the Haunted Mansion ice cube tray in action! I love the green and purple, but those were the exact shades of my wedding colors, so I'm biased. 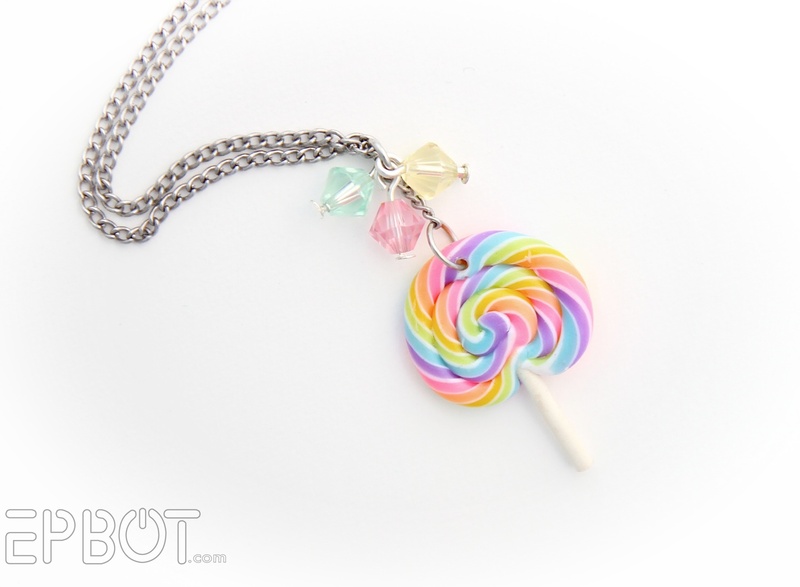 That lollipop necklace is tooooo cuuuuute. Jen, if you ever open an Etsy shop, you will make a killing. Just saying. I like the teal/green bead, it has some of that coppery color to it which looks great. I think red (Like a blood red, not like a cherry red) and black would also be decent accent bead colors. And that lollipop is ADORABLE. Wonderful necklaces! Since the bats are gold, I like the purple a teeny bit more than the green. I like to combine beads of that color green with copper, it's a pretty combination. You can't really go wrong as long as you love them! Well-done with the new tool. I experimented with the 1-Step Looper at work for quite a while but could never get a decent loop with it, so I'm sticking with my trusty round-nosed pliers. The ice tray cometh! Or was it a chocolate mold? Ice tray - but it's silicon, so you can use it for either! Those are AMAZING!! 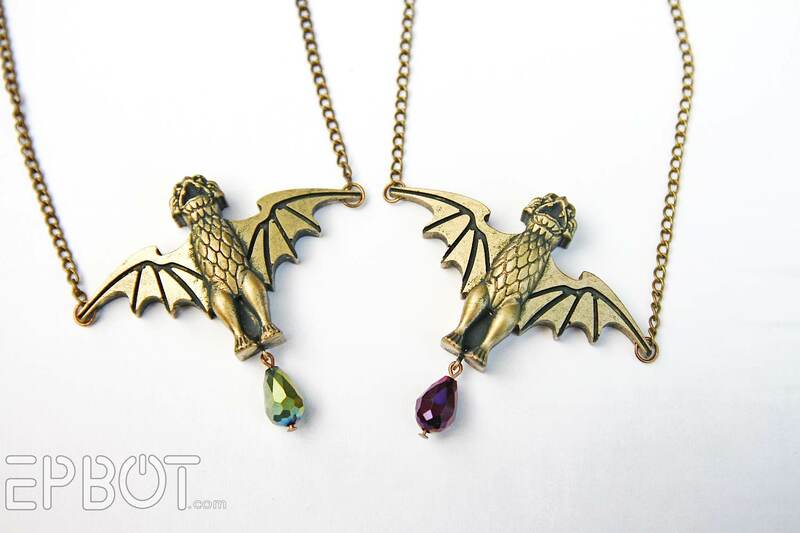 Yes, I'm on Team Purple too for the bat-necklace teardrops. The green bead looks more---I don't know that I'd call it "cheap", but definitely somehow *lighter*, less somber and menacing than the purple one. I'd like to see either a really radioactive-looking poison green or a mysterious deep emerald instead. And I totally second the votes for blood red and jet black for additional colors, and perhaps black "pearl" or hematite as well? Thank you for picking me! I sent an email. I love the green/teal bead, but that is one of my favorite colors so I may be biased. Definitely like the crystals--both of them. The green bead looks good. It plays well off the golden color of the bats. I think with a design like that you could really go for any color. A blood red could be cool. I like green best! Those are amazing! I also enjoy the green. But the purple does make it look more dark. Ooohh. What about TEAL? I LOVE the bat stantion pendants! (In fact, they make the perfect excuse to head over to MK to grab the ice cube trays. ;) Question though if you don't mind. What type of resin did you use? I've wanted to try it for awhile now but they all have warnings not to use in high humidity which is, as you know, like ha ha ha ha not... here in Florida. Low humidity! As if. ;) Anyway, wondering what worked for you. Thanks! WAIT. The Looper is a thing? How did i not know about it? As a jewelry company owner i make approximately 3,999,986,558 loops a week. i am going to get one now. 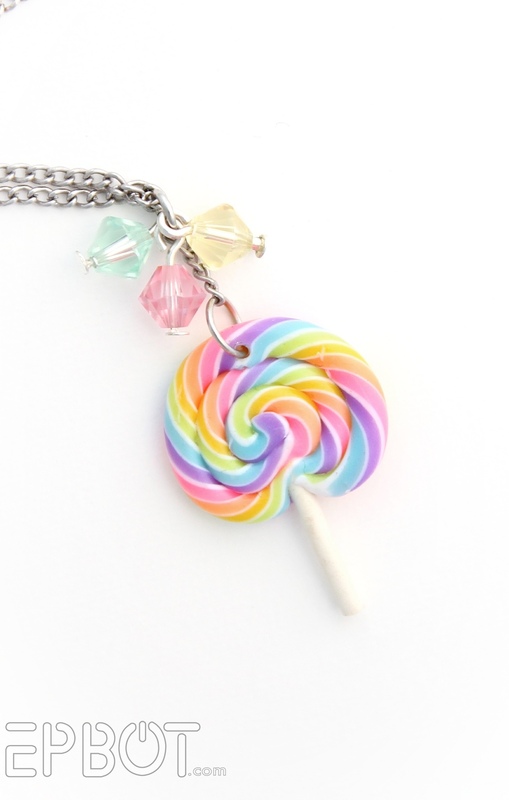 BTW - the lolli necklace is fantastico. Need a vacuum pump for excellent molding results, but you've already managed to do a fabulous job. 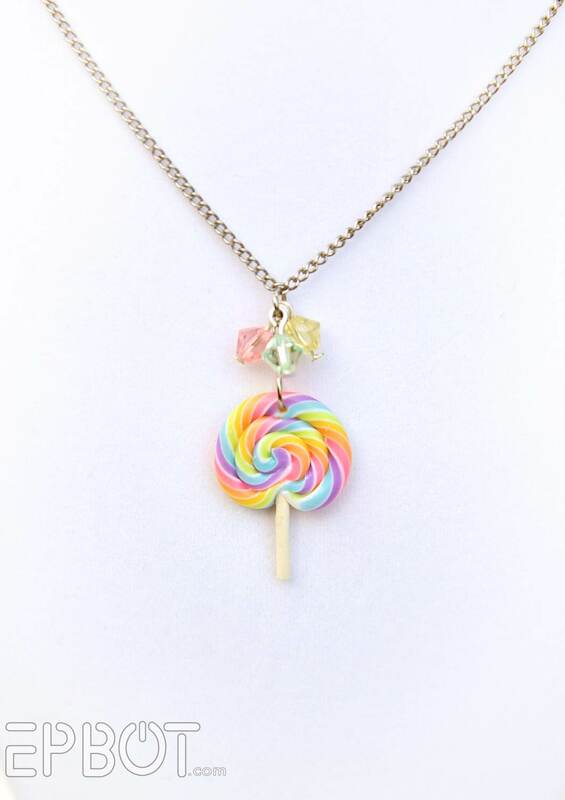 That lollipop necklace is so adorable! I will have to try and get one for my niece.